Caps Basketball: Are Teams With Black Uniforms Cheating? Are Teams With Black Uniforms Cheating? 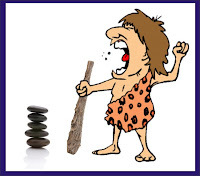 Millions of years ago, when hockey was invented by cavemen in the north pole, they didn't have hockey skates or pucks. Instead they would slide around barefoot on the ice, hitting a chunk of ice with a tree branch. Back then, many games ended in controversy because often times the "ice puck" would blend in with the actual ice and snow, and other chunks of ice would end up leading to a situation where there were multiple "pucks" on the ice. In order to solve this white on white problem, one bright caveman came up with an idea. "Booga Booga Boog, Blerg Ug", which roughly translates to "Me take Tar, Make Ice Black". While that caveman did have the foresight to realize the ice needed to look different than the puck, his idea wasn't much of a solution. The cavemen soon found out that the tar was less "slippery" and more "super sticky." Games would often end early when all the players became stuck in the tar. The problem was not solved. The cavemen decided that maybe this game could not work. They began to play other sports like basketball and woman tossing. 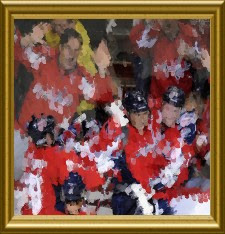 Until one amazing day Ugga the caveman changed hockey forever. Ugga was building himself a new fireplace for his cave. He had to cross the pond to find stones and rocks for his project. One day while he was transporting materials, Ugga slipped on the ice and dropped all his rocks. Upset at first, Ugga cursed the god of ice, but while picking up what he dropped he noticed that the easy rocks to spot were the black ones. And that is how hockey pucks became black. So What Does This Have To Do With Cheating? In baseball a pitcher can't play with a white baseball glove. This is true because the ball is white and it would cause problems for hitters seeing the ball coming out of the glove. So why do some hockey teams have black uniforms? 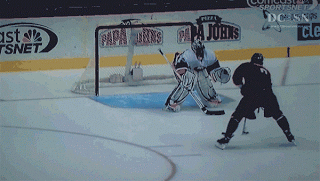 Doesn't this make it tough for a goalie to see the puck? From what I have noticed so far, in order to score goals teams try to screen the goalie so he can't see the puck coming. I feel like these black uniforms are helping with this task, making it hard to see a black puck when there are black jerseys everywhere. Therefore, I demand the following teams change their uniforms: Ducks, Bruins, Hurricanes, Dallas?, Kings, & Penguins. This also applies to the teams who are really cheating, adding an alternate jersey of black to hide the puck: Blackhawks, Senators (kind of), Flyers, Coyotes, & Sharks. And if you don't, the Caps are gonna be wearing these Alternate uniforms every game! 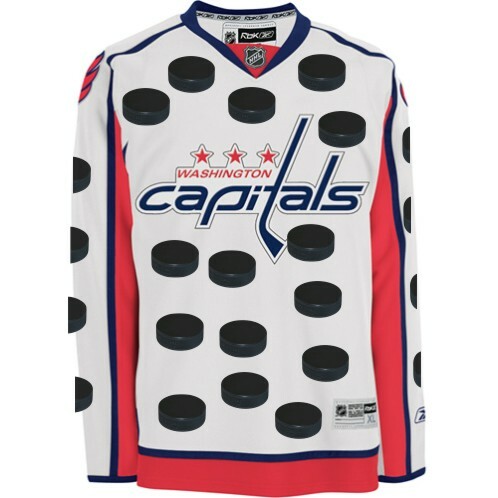 Great jersey till the caps are on the defensive! Maybe you're onto something here! Only 5 of the 30 NHL teams wear black as their primary color (Carolina's primary jerseys are red; their black jersey is an alternate like Chicago, San Jose, etc.) Yet, teams with black as their main jersey color have won 3 of the last 5 Stanley Cups and 4 of the last 7 (Tampa Bay wore black when they won in 2004)! And throw in the Cups won by secondary black teams Chicago (2010) and Carolina (06), and that's 6 of the last 7. But, take the timeline back a ways and the edge disappears. From 1973 through 2003, black jersey teams won only 3 titles (the Pens in 1991 and 92 and the Stars in 1999). Plus from 1980 - 1990, teams wearing orange and blue (Islanders and Oilers) won 9 of 11 Cups. That was pure coincidence.